Vince is willing his team to win after win. Unbelievable. ... but it's the Bengals that took their foot off the pedal... (Week 10 NFL Bonus points updated 11/10/08. 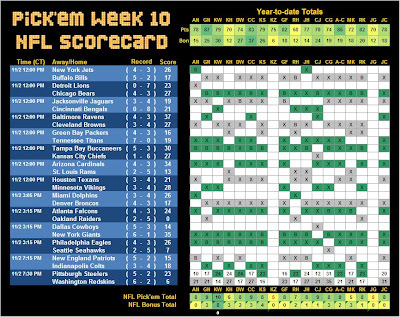 Sorry for the delay, but they will magically appear after the Week 11 final scorecard is posted). Props to Kyle... the only playa that cracked double digits this week (no one hit doubles in NCAA).